The RTR-574 Wireless Temperature Humidity Light Data Logger includes two sensors that simultaneously measure and record illuminance / UV intensity and temperature/humidity. This Data Logger allows for the measuring and recording of the above items in various places such as facilities where people gather, where important documents and fine arts are being stored or displayed, where food and drink are being stored. Also, cumulative illuminance and the cumulative amount of UV light can be easily viewed even without stopping recording. The large display allows you to easily check the RTR-574’s recording status, battery status and remaining data capacity as well as all types of measurements. Besides measuring and recording Illuminance, UV, Temperature, and Humidity, the RTR-574 calculates and displays the “Cumulative Illuminance” and “Cumulative Amount of UV Light” during recording sessions. Note: * The cumulative values are for display only. They are not recorded. It is possible to connect an RTR-574 Wireless Temperature Humidity Light Data Logger directly to your computer with a USB cable. Data can be quickly and easily downloaded to your PC. If the computer has more than one USB port, it is possible to connect multiple RTR-574 Units to one computer at the same time. Note: * This is not possible if your operating system is Windows XP. Up to 8,000 data sets can be stored in one logger. One data set consists of readings for all channels in that type of unit: Illuminance, UV intensity, Temperature, and Humidity. Select the Recording Mode from Endless or One Time. When using Endless Mode, upon reaching the logging capacity the oldest data is overwritten and recording continues. When using One Time, upon reaching logging capacity recording automatically stops. When using RTR-500GSM, RTR-500NW or RTR-500AW as a Base Unit, only “Endless can be selected. The Illuminance measurement range is from 0 to 130,000 lx; which means it is possible to measure in both dim moonlight and the bright summer sun. And with recording and display possible at a resolution down to 0.01 lx, measurements can be taken in conditions of even less light. 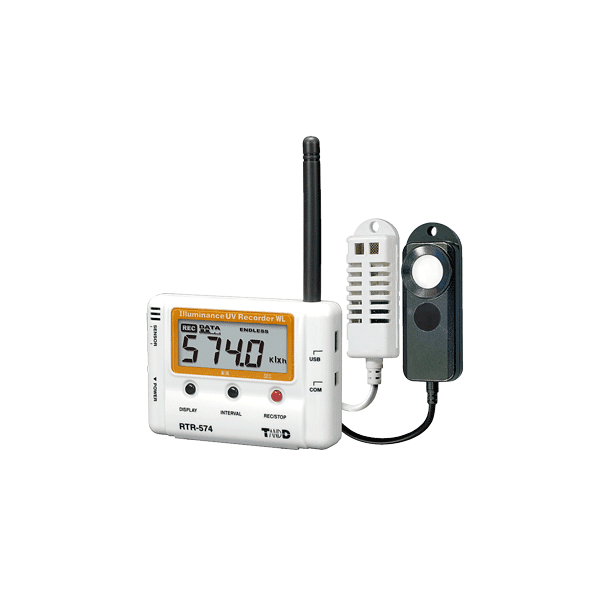 The buttons on the face of the RTR-574 Wireless Temperature Humidity Light Data Logger make it possible to change the LCD display pattern, start and stop recording, make or change recording interval settings, and turn power ON or OFF. To prevent unexpected errors in button operation, you can use the software supplied with the Base Unit to lock the button operation. >> Back to the Alternate Display. By pressing the Display Button it is possible to switch between continually viewing all items in a cycle or select only certain items for viewing. Use this button to check the current Recording Interval and make any necessary changes to it. Power is provided by one AA alkaline battery. If one RTR-574 at full logging capacity is downloaded once a day via wireless communication, the estimated battery life is about four months. Note: * Battery life varies depending upon the type of battery, the measuring environment, the frequency of communication, and the ambient temperature in which it is used. All estimates are based on operations carried out with a new battery and are in on way a guarantee of actual battery life. An Adjustment Function has been included to aid in the adjustment of measurements. This Function can be set up with the “Adjustment Tools” application in the software supplied with the Base Unit. Recording Intervals Select from 15 choices: 1, 2, 5, 10, 15, 20 and 30 sec. / 1, 2, 5, 10, 15, 20, 30 and 60 min. Communication Time When downloading one Remote Unit at full storage capacity: Wireless Communication = about 4 min. (*4) / USB Communication = about 45 sec.